Figure 3. Map of PPNA sites in the Levant. The stippled area marks the Levantine Corridor. former seems to have been a transitional short-term stage between the Natufian communities and the fully farming Sultanian ones. Most of the PPNA sites known are located in the Jordan Valley, and none are known in the Negev (Fig. 10.3). Regardless of possible sampling problems, it is important to note the change in settlement pattern from the Late Natufian to the PPNA. 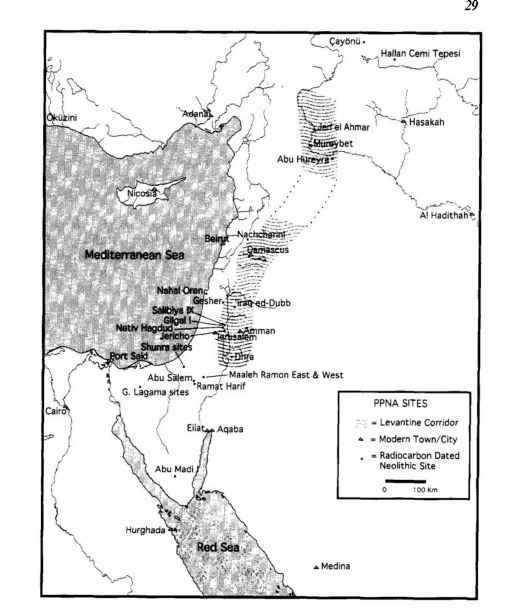 Whereas the larger Natufian sites were all located along the western ecotones, the larger PPNA sites were situated in the Jordan Valley and the smaller ones (such as Nahal Oren) on its western flanks (Bar-Yosef 1991; Kuijt 1995; Chapter 9, this volume). The abandonment of some of these areas, or at least the increased focus on the Jordan Valley, suggests that not all of the Natufians managed to transform to the next stage of sedentism and food production. Subsistence practices of the PPNA communities were based on intensive collection or cultivation of cereals and legumes, although gathering of wild fruits and seeds as well as hunting of wild animals, particularly gazelle, continued. PPNA sites vary in size, but they are clearly larger, on average, than the Natufian settlements. Structures in the PPNA are rounded or oval and have stone foundations and superstructures of unbaked mud bricks. Evidence of communal building is illustrated by the walls and tower at Jericho, and the presence of silos—small ones (built of stone) or larger ones (built mainly of mud bricks)—found in most sites. The emergence of longdistance exchange of Anatolian obsidian in the PPNA is seen from excavations at someJordan Valley sites, such asJericho and Netiv Hagdud. Art also changes, with the human figure-mainly female-gaining predominance (Bar-Yosef 1991). The subsistence strategy of food-producing communities in the PPNA still had more in common with complex foraging groups than with simple foraging ones (Woodburn 1982 in Henry 1991), as it aimed at attaining greater security through intensified resource exploitation and development of surpluses. Population growth, coupled with scarcity or depletion of resources, increases the importance of social organizations and mechanisms that principally function to "closedown" and formalize access to resources and intensify their exploitation. Thus, in many ways the structure and dynamics of social organization in complex foraging societies mirror those of agricultural societies. Much of this can be observed in the archaeological record of the earliest Neolithic period in the Levant. Studying the mechanism of cultural transmission and the viability of nuclear families helps us to understand how individuals survived the collapse of complex societies (Kosse 1994) or how they successfully moved from one social framework to another during the PPNA. It also explains how certain cultural traits and cultural units survived the collapse of the Natufian interaction sphere: unlike genetic traits, cultural elements can be adopted, and small groups can be incorporated into larger ones while preserving much of their cultural distinctiveness (Kosse 1994).Natufian innovations were only sporadically embraced by their descendants in the PPNA, although Kuijt (1996) has recently presented arguments for considerable continuity in mortuary practices between the Late Natufian and PPNA. This is as can be expected, since the mere availability of a novelty or invention does not guarantee its widespread adoption, which does not seem to follow "... automatically upon the inception of the new process or form but depends in a complicated way upon individual choice governed by social and other factors" (Renfrew 1978:396).It seems that whenever individuals are faced with the necessity of making a choice, they prefer to stick to what is known rather than "moving at once to a new global optimum" (Renfrew 1978:396).For one thing, opting for a novel course of action is risky, as one cannot be entirely sure of the consequences of such a choice. In addition, there is the sheer difficulty of abandoning old habits for new ones, which likewise tends to encourage "conservatism. "All this is in agreement with the view that most innovations involve, at least initially, little more than new ways of doing old things (Renfrew 1978). Only later do technical developments amplify the existing divergence to such an extent that it comes to be recognized as an innovation, as for example the technology of groundstone and bone tool production (for detailed discussion see Bar-Yosef and Belfer-Cohen 1992; Bar-Yosef and Meadow 1995;Cauvin 1994; Moore 1985). 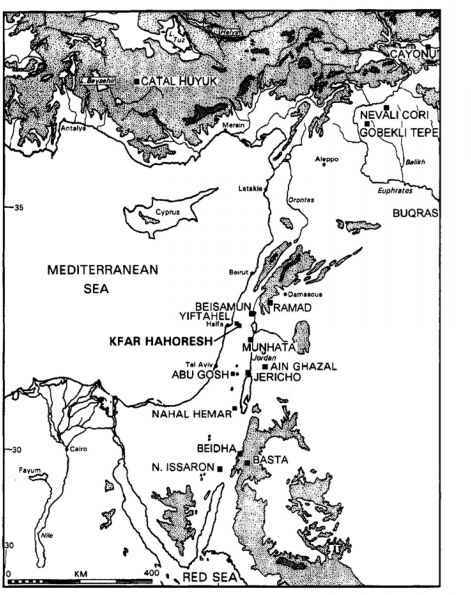 Toward the end of the Natufian and throughout the PPNA, various loci of incipient sedentism and cultivation were forming elsewhere in the Near East, wherever local conditions and the climate were appropriate (Bar-Yosef and Meadow 1995,Chapter 3, this volume). This is well illustrated in southeast Anatolia and the northernLevant by the transition from mobile hunter-gatherers to sedentary foragers in Hallan £emi (Rosenberg and Davis 1992) or the establishment of agricultural communities in Qermez Dere (Watkins et al. 1989, 1991), and the base of Cayonu (Ozdogan and Ozdogan 1989). This seems to confirm the view that "residential corporate groups probably emerge under conditions where access is restricted to important resources and/or where there is frequent need for many people to exploit these resources most effectively" (Hayden 1990:38). It seems that some of the developments in the Levant were influencing the course of events in neighboring areas of the Near East through some sort of domino effect. In light of the great geographical distance between such sites as the Late Natufian Mount Carmel sites and those in northwest Iraq or southeast Turkey, it appears that these occurrences developed independently of one another. Apparently, human groups throughout this region were susceptible to these changes, the main difference being the matter of timing (determined by such factors as the degree of complexity of social structure within the particular group,the length of time that it sustained scalar stress, etc.) and local conditions (i.e., the reliability, accessibility, and distribution of specific resources, such as wild stands of cereals). Indeed, the dimensions of time and scale are of crucial importance here. While similaritiesobserved between the Natufian assemblages can be interpreted as indicative of some central, coherent social force, the cultural diversity observed in the southern Levant by the end of this period seems to indicate a disintegration of this social system. Similar tendencies are observed within the much later PPNB societies in this region (Bar-Yosef and Belfer-Cohen 1989b), but, contrary to the situation during the late PPNB (Rollefson 1987, 1989; Rollefson and Kohler-Rollefson 1989), in the Late/ Final Natufian there is a strong feeling of decentralization in the core area and adjacent regions, as well as in regions further away. As the various vegetation zones in the Levant differ markedly in environmental conditions, there is hardly any room for speculation regarding the Natufians' alleged role as the instigators of Near Eastern sedentism (Watkins 1992). Thus, although the earliest evidence for sedentism comes from the Early Natufian core-area sites, later instances of sedentism in the Levant are sporadic and unconnected, seemingly reflecting local adaptations. Indeed, it seems that we are presented with instances of parallel cultural evolution, and the similarity observed stems from a common denominator shared by all these communities. The fact that all these groups are basically similar (all of them being complex hunter-gatherer communities) explains why eventual similarity in environmental circumstances can be expected to have led them to similar responses, including sedentism or semisedentism. Hayden (1990) argues that complex societies are primed for agriculture, and its actual appearance is dependent merely on the availability of suitable plants for cultivation or animals to domesticate. In much the same way, it can be argued that the Northwest Coast Indian societies were ripe for agriculture at the time of the European conquest, as demonstrated by the extremely rapid spread of potatoes to all coastal groups within a brief fifteen-year period. This contrasts markedly with the frustration experienced by missionaries and government administratorswho tried to introduce agricultureto more generalized hunter-gatherers in Australia, Africa and North America, to no avail. It is of interest to note that the basic inclination of human groups in the face of resource shortage has been found to be almost anything but food production. Only after all the other options were explored and found unsatisfactory, will a group resort to producing its own food. Most explanations for this phenomenon center on the relation between costs and returns in the matter of food production (Hayden 1990:35). Viewed collectively, studying settlement practices and variation in material culture within communities helps us understand the transition from foragers to agriculturists of the Neolithic period. Economic and social stresses during the late Younger Dryas were relieved through the adoption of strategies such as aggregation, territoriality, intensified resource exploitation, and probably incipient agriculture. It is worth noting that these reactions of the Final Natufian/Early PPNA communities were different from those of the Early Natufians some 2000 years earlier. The transition to full sedentism was not smooth, and sometimes progress was hindered and reversals occurred. Thus, the Harifian culture from the Negev (dated to 10,700-10,100 bp) and the Abu Madi I entity (10,100-9,700bp) from southern Sinai (Bar-Yosef 1985), which are partially contemporaneous with the PPNA of the Jordan Valley, preserved more elements of the core-area Natufian tradition in lithic technology and settlement pattern than have contemporaneous assemblages recovered from the core-area itself and its neighboring regions along the Levantine Corridor. These sites, located in the more marginal areas of the Levant, though having well-built dwellings and permanent installations, were occupied seasonally as part of residential moves, similar to those of historical Bedouin groups (Bar-Yosef 1984). The same is true also for the succeeding PPNB cultures, which show a clear dichotomy and time lag between full-fledged agricultural sites in the fertile lands and hunter-gatherer sites in the arid zones. While the process began with the Early Natufian, about 13,000 years ago, it is only some 6,000 radiocarbon years later that we can unequivocally state that the entire Near East is populated by agricultural societies, whether farmers, herders, or both.